Here are a few Motivational Monday stories for you to kick off Thanksgiving week... enjoy! Sarah has made some serious progress on her quest to get fit! "After breaking my tibia and fibula while mountain biking at the beginning of this year, I was unable to work out in order to lose the significant amount of weight I have gained over the last 3 years. 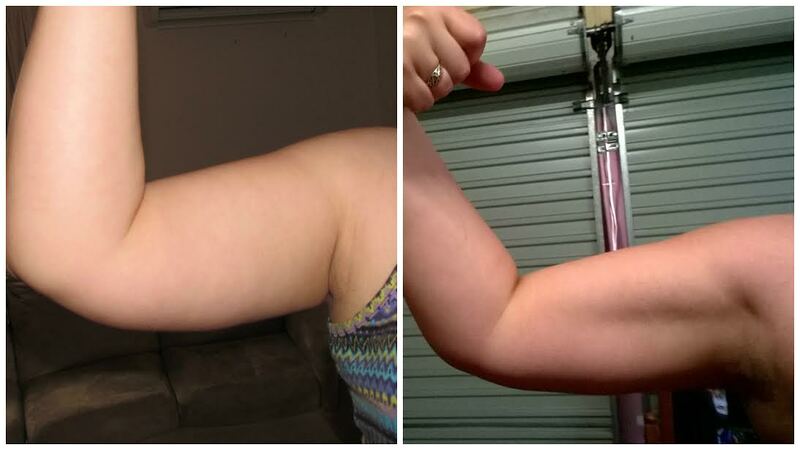 I started working on my strength training and cardio on the first day I could walk in June after my injury. Since then, I started using my Fitness Pal and have been using it daily to watch my intake. Since July 1, I have lost 11.6 kg (25.5 lbs), over 107 cm throughout my various measurements, and logged almost 700 kilometers (430 miles) walking and riding my bike! I still have a long way to go, but I'm proud of my accomplishments thus far." 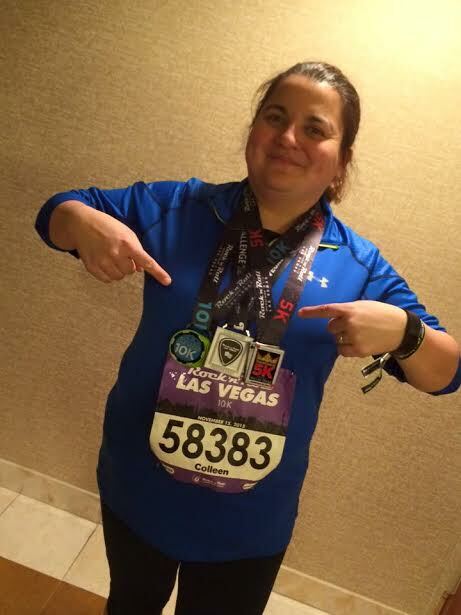 Colleen and her husband went to Vegas along with several of the From Fat to Finish Line community members. (From Fat to Finish Line is the documentary that I took part in--finally to be released in January!--and there is a pretty big community on Facebook of people who have gone/are going "from fat to finish line"). I actually got to meet Colleen and her husband at the Detroit Marathon last month! "We had such a blast running/walking the 5K and 10K in Vegas Nov. 14-15. I PR'ed my 10K and it was by about 40 seconds. It was Ken's first 10K ever! Our 5K, we both had a PR. I was so proud of myself because I beat my 5K time by 7 minutes and 17 seconds. I can't wait to sign up for more races and especially Rock N Roll ones. Very well organized event and the bling was AMAZING! We also were able to meet a bunch of the members and followers of From Fat to Finish Line. Great group and such supportive new friends of ours." 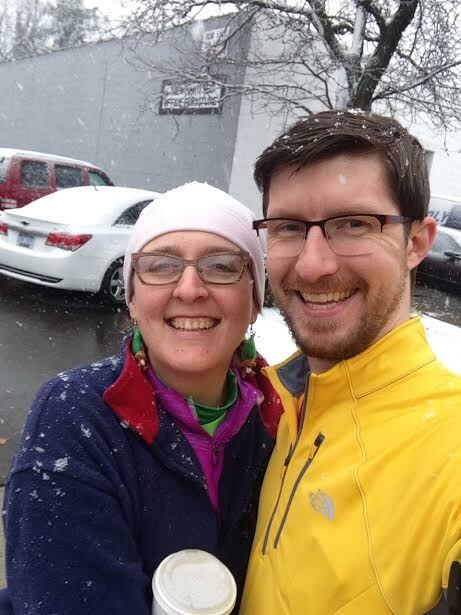 Erin is proud of her friend for finishing her first 5K; and she and her husband joined in on the fun! 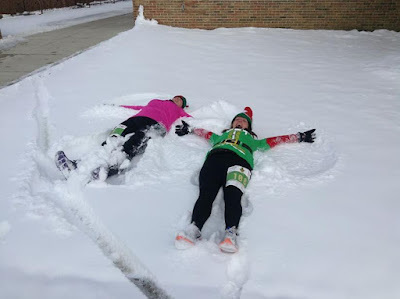 "My friend Pam has been doing a couch to 5K plan, so when she mentioned she might try the Ferndale Michigan Holiday Hoof, I knew I had to tag along. Little did I expect that it would be snowing and sticking on Saturday morning! My husband, Josh, who is a frequent race partner and a big motivator for me, joined us for the race (the attached photo is a pre race shot, I chugged my tea before the run started). Pam did a great job run-walking her first 5k in about the same time that I ran my first one. And, we all got warm at the FestivAle Christmas Beer festival after the race." "Much like your weather, we got hit pretty hard with about a foot of snow on Friday night. My friend, Lori, and I had registered for a 6 race series called Conquer the Cold. The series is one race a month from October through March. The November race (The Elf Run) was scheduled for Sunday. 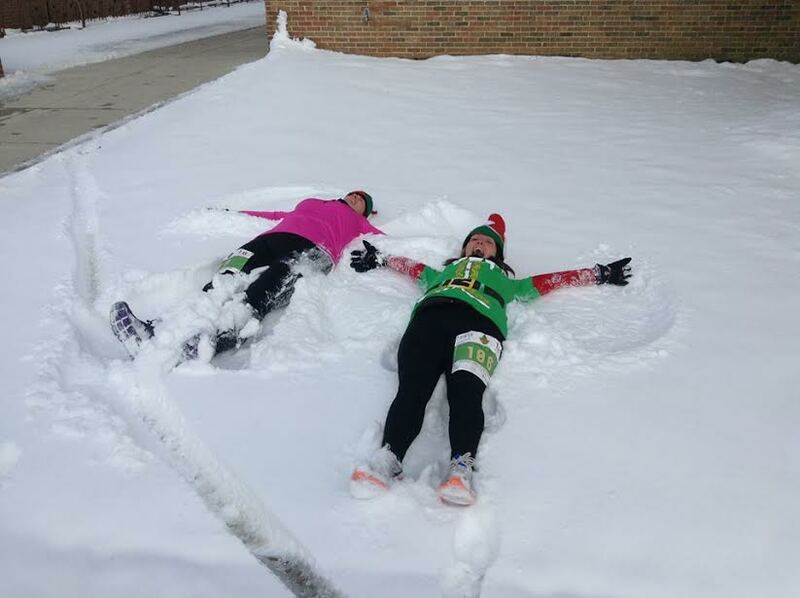 It was SUPER COLD (4 degrees when we left home) and the snow and ice would have been a great excuse not to run. Instead we went for it. I ran 2 minutes slower than my October race but I'm going to excuse it due to the ice and technical issues with my GPS and music. It was a great race and we are so glad we completed it. 2 down and 4 to go!" Ruth uses zero excuses to get in some exercise at work! And it's paying off. "I've been portion controlling and really trying to make healthy choices for the past couple weeks and I'm down 8 pounds! 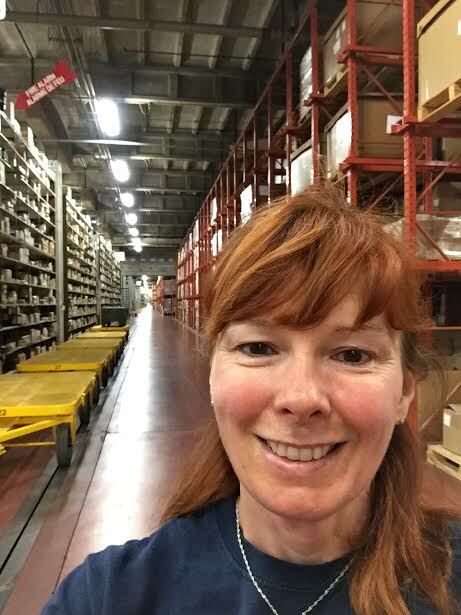 This is me walking the warehouse aisle at lunch, about 1 1/2 miles for three laps." Congratulations to everyone! I love the MM posts, I really do feel like I get motivated reading about someone else's success. I was a bit shy about my small acheivement, but small steps lead to big things. Again, I am always inspired reading Monday's blog, thankyou! Amazing accomplishments everyone! Loved hearing about the Conquer the Cold series! What a great idea to help get through this winter!